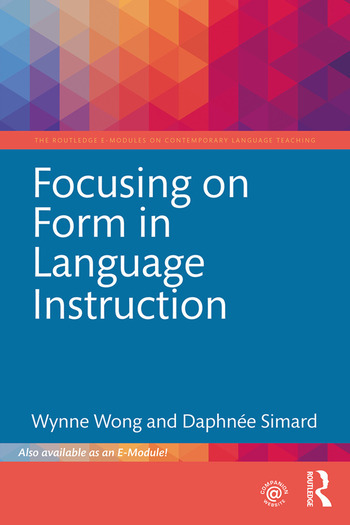 This module on focusing on form in language instruction provides novice and experienced instructors with pedagogical techniques to help second language learners acquire formal elements of an L2. Taking the position that the development of a linguistic representation requires input, the pedagogical interventions presented in this module—textual enhancement, structured input, and dictogloss—all work with meaning-bearing input in some way. These techniques aim to increase the likelihood that learners focus on aspects of language that are useful or necessary for building mental representation. The module also discusses how explicit information may play a supporting role in helping learners process input. Wynne Wong is Professor of French and Second Language Acquisition and Director of the French Basic Language Program in the Department of French and Italian at The Ohio State University, USA. Daphnée Simard is Professor in the Department of Linguistics at The University of Quebec in Montreal, Canada.